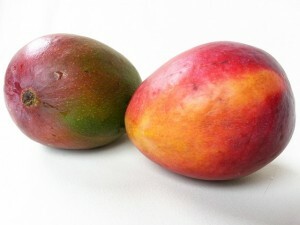 To select a ripe mango gently squeeze the fruit, a ripe mango will give slightly to the pressure. Ripe mangos have a slight fruity aroma near the stem; they should not smell sour or like alcohol. Mangos should be full, plump and round or football shaped. Small brown spots are normal on mangos but avoid fruits that have shriveled skin. Colors in ripe mangos vary so color is not a factor when selecting mangoes. Ripe mangos should be stored in a plastic bag in the refrigerator for up to 2-5 days. Wash the mango and then peel and slice the fruit. Place the pieces in a single layer on a baking sheet and place them in the freezer. Once the mangos are frozen place them in an airtight container and store them in the freezer. Mangos can also be frozen in a sugar syrup. Mix 1 cup of sugar and 2 cups of water in a pot, stirring constantly to dissolve the sugar, bring the mixture to a boil. Allow the syrup to cool and then pour it over the mango pieces and store in a freezer container. Mangos ripen best at room temperature, becoming sweeter and softer over several days. To speed up the ripening process, place mangos in a paper bag at room temperature. Adding an apple or banana to the bag will speed up the ripening process even further.